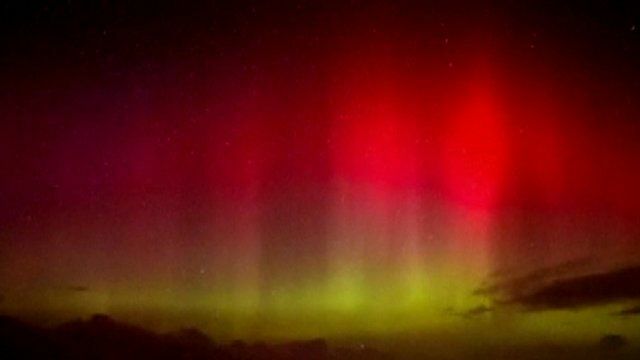 Unusual Northern Lights head south Jump to media player The Aurora Borealis, also known as the Northern Lights, have been creating a fabulous show across large parts of the Britain, and across the globe. Northern Lights shine over IoM Jump to media player The Aurora Borealis, better known as the Northern Lights, are photographed by a stargazer on the north west coast of the Isle of Man. Northern Lights glow in UK's night sky Jump to media player The Northern Lights - or Aurora Borealis - have been creating a fabulous show across large parts of the Northern Hemisphere. Awesome timelapse of Northern Lights Jump to media player Timelapse video has captured a spectacular show of the Northern Lights, visible from northern parts of the UK. Timelapse captures Northern Lights show Jump to media player Timelapse video has captured a spectacular show of the Northern Lights, visible from northern parts of the UK. Northern Lights touching sunrise Jump to media player US space agency Nasa release a stunning clip showing the Northern Lights touching sunrise over Earth. The Aurora Borealis, also known as the Northern Lights, have been creating a show across large parts of the Britain, and across the globe. Far more people than usual were able to see the celestial display, due to increased solar activity which brought the lights down much further from the Pole. The Southern Lights, or Aurora Australis, have also been unusually bright. They were visible over the Australian and New Zealand mainland on Tuesday night.